I love Instant Pot Banana Bread. Give me a warm slice with a thick pat of butter all melting on it, and I’m a happy girl! I enjoy making quick breads in the Instant Pot®. Being able to “bake” and having the oven available for other recipes is great! 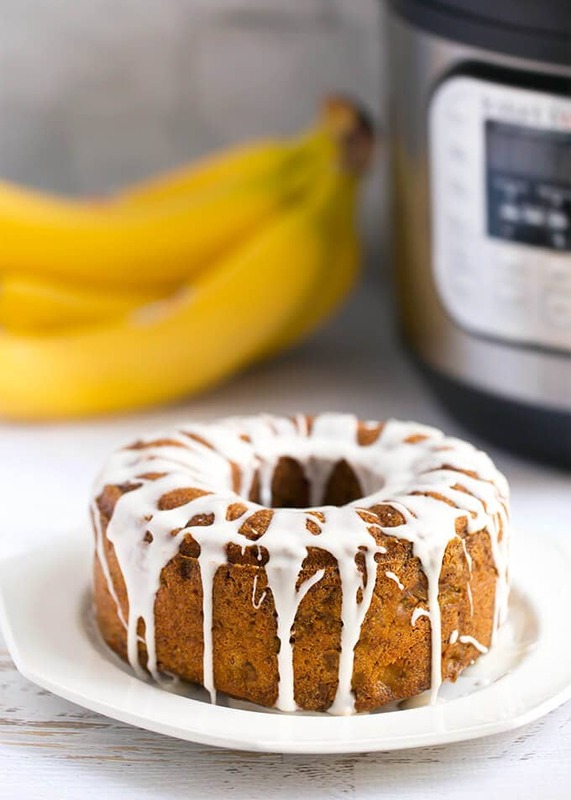 This pressure cooker banana bread is a moist, dense bread, so making it in the instant Pot is perfect! Banana Bread is the comfort food of bread. At least for me. The smell of banana bread baking takes me home. Banana Bread was the first bread I ever cooked when I was a kid learning to bake. Great memories from our humble little kitchen. Start with fully ripe bananas. If your bananas are not ripe, there’s a hack for that! Set the oven temperature to 300°(F). Place the unpeeled unripe bananas on a parchment lined baking sheet. Bake them for about 10-25 minutes. Keep an eye on them as they can ripen fast and even leak (Oven temps and times may vary)! They are ripe as soon as the peels are shiny & black. The very best pan to use for this recipe is a 6 cup bundt style pan. The banana bread comes out very evenly cooked. 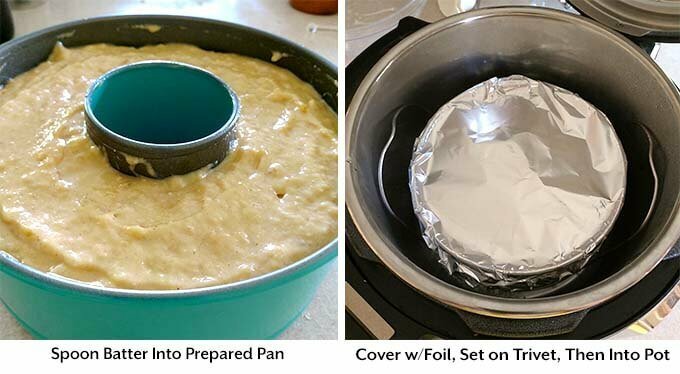 You can use a 6″ or 7″ cake pan, but the cook time will be longer due to how the pressure cooker cooks (and not having the hole in the center). With quick breads you’ll want to be careful not to over mix the batter. Once you get the dry ingredients in with the wet, stir just until they are combined. 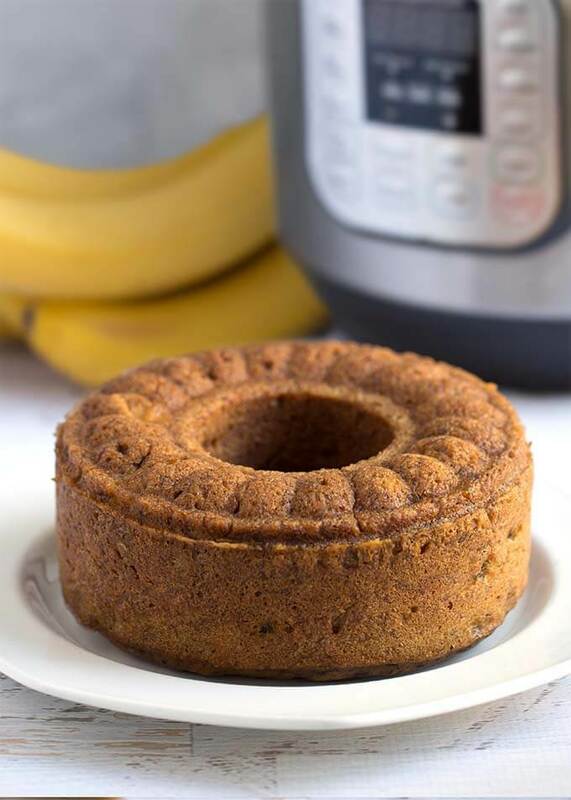 Instant Pot Banana Bread is cooked using the Pot-in-Pot (or PIP) method of pressure cooking. That just means the food is in a pot/pan within the pot of the pressure cooker. The pan with the food in it will sit on a rack above the water in the pot. This method works for any recipe that is too thick to put directly in the pressure cooker pot, and/or can’t be watered down. 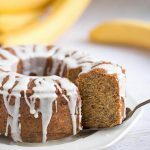 Serve this delicious Instant Pot Banana Bread warm with some butter, or try my Vanilla Icing Glaze for a special presentation! It’s a little unusual to put icing on banana bread, but I like the presentation. The bit of extra sweetness is delicious, especially when warmed up with some butter on it! 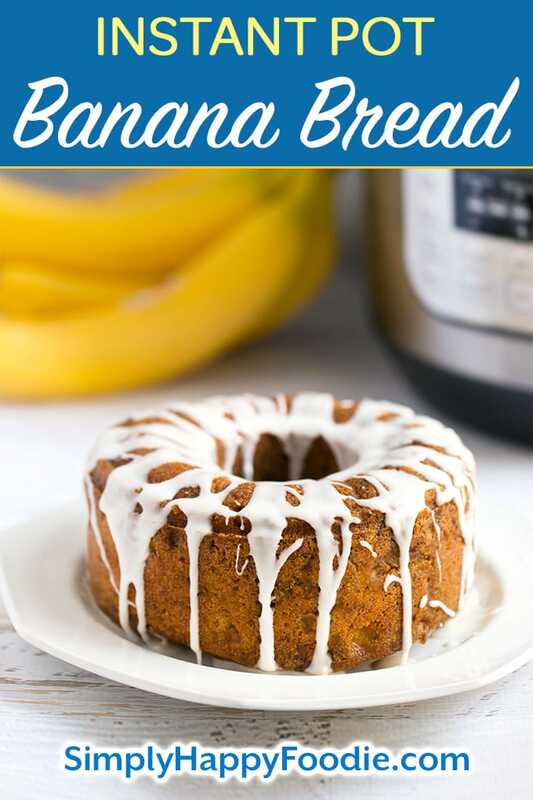 Instant Pot Banana Bread tastes just like my Nana's banana bread. 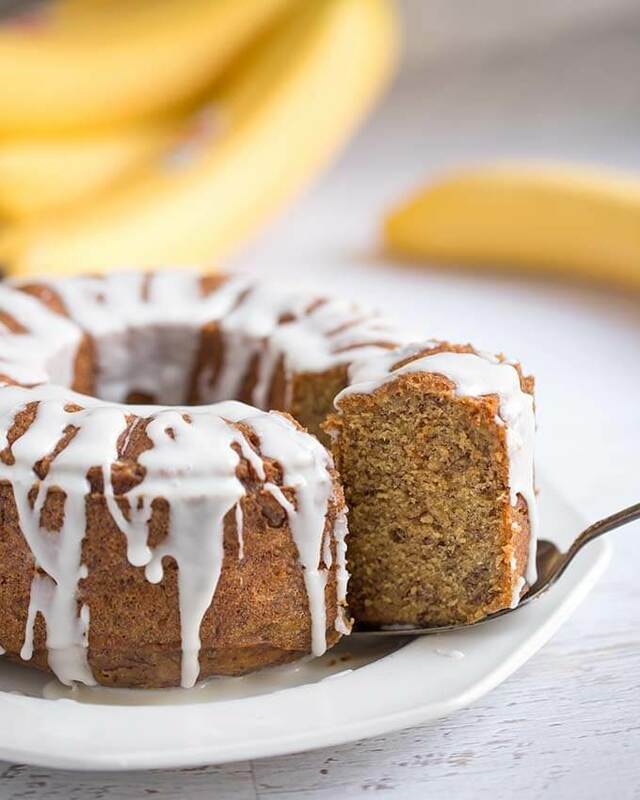 It's moist and sweet, with an optional vanilla icing that makes this banana bread dessert! Add 1 1/2 cups of water to the inner liner of the pressure cooker (2 cups if using the 8 qt). Spray the cake pan with baking spray and set aside. In a mixing bowl, mash the ripe bananas using a fork. In another mixing bowl, use a hand mixer to cream the butter and sugars together. Add the beaten eggs and vanilla to the creamed butter/sugar mixture. 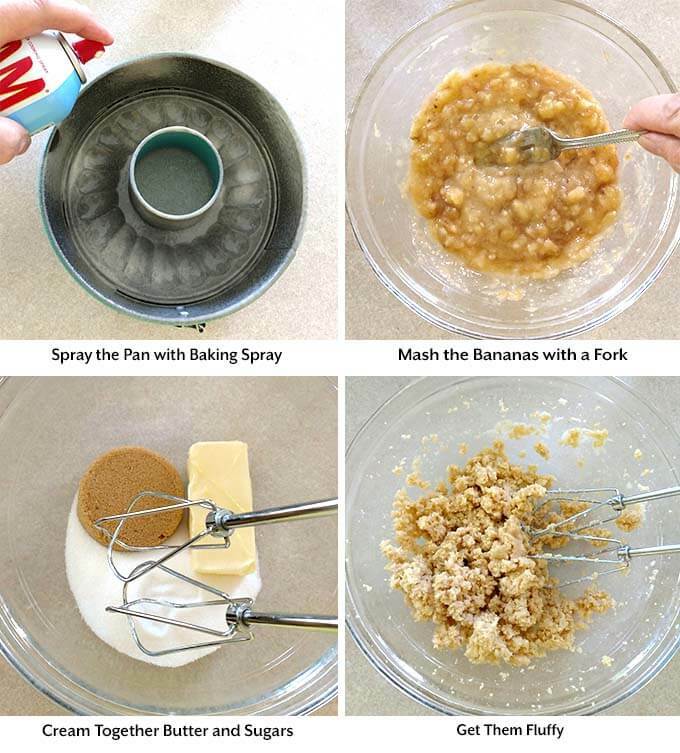 Use a spoon to mix well. 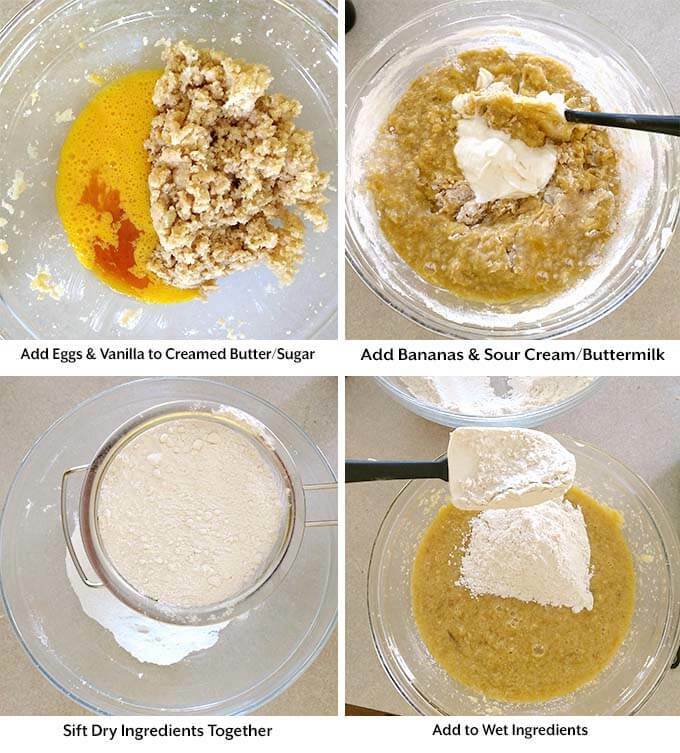 Stir the bananas and sour cream/buttermilk into the butter/sugar mixture and mix well. In another mixing bowl, sift together the flour, baking soda, baking powder, cinnamon and salt. Add the dry ingredients to the wet ingredients and gently stir by hand, until just moistened. Spoon the batter into prepared cake/bundt pan and cover with foil, leaving some room for the bread to rise a little. Gently crimp the edges. Set the trivet on the counter, and put the cake/bundt pan on it. Carefully place it in the pot using the handles. Close the lid and set the steam release knob to the Sealing position. Press the Pressure Cook/Manual button or dial, then the +/- button or dial to select 47 minutes for a bundt style pan, and 60 minutes for a regular 7" pan. High pressure. After the cook time is finished, let the pot sit undisturbed for 15 minutes (15 minute natural release). Then turn the steam release knob to the Venting position to release the remaining steam/pressure. After all of the pressure is out and the pin in the lid drops down, open it and use silicone mitts or pot holders to very carefully remove the cake/bundt pan from the pressure cooker, using the trivet handles. Carefully remove the foil, and let the banana bread sit for 10-15 minutes to cool a bit. Then release the bread from the pan onto a plate. Either invert the pan, or with a push pan, set it on a can and gently push the pan down. Serve the banana bread warm, slathered in butter, or let it cool and drizzle with my Vanilla Icing Glaze. Can you use parchment paper instead of foil to cover while baking? Hi Sandy, I think so, as long as it keeps the water out. Securing it to the pan may be a challenge. Perfect banana bread. My whole family loved it! How long do we cook it for, recipe says warm up the pot then natural release 10 min. How long is cook time. Hi Dawn, cook for 47 minutes if using a bundt style pan, and 60 if using a regular pan. Hi Sandy. May I ask what size bundt pan you used? Yes, it’s a 7″ bundt pan from Debbiedoo’s (my affiiate link). How long would cooking time be if I used egg bite molds? I’m not sure as I haven’t tried it. Just wondering if you tried this out using egg molds and time used? Would be chrious to try this, as it would be great to have a bite size bread! What adjustments do I have to make to do this in Duo Mini?. You will want to use a 6″ pan instead of a 7″. leave room at the top for the bread to rise higher, and increase the cook time 5-10 minutes. Perfectly delicious! I followed the recipe as written except I used nonfat, plain Greek yogurt in place of sour cream. I used a 6 inch Bundt pan. Thank you for sharing your recipe! That’s great, Amy! So glad you liked it! If i only have 2 bananas should i change anything in the recipe. (not a real good baker & first time in instant pot, with my new pan) Will it just not have as much Banana flavor! Thank you! It won’t have as much banana flavor, but will still be good. You could add a little applesauce to make up for the reduced moisture. Hate to toss it? I have a much smaller silicone instant pot accessory set I thought would work. It probably only holds 3-4 cups not six. My current bundt pans and spring form pans are too big for the instant pot, help! Hi Cheris, sorry I was out yesterday and didn’t get to this comment the same day. You can divide the batter into smaller batches and cook for less time, or just use the oven. How important is baking powder? I have everything on hand except that. I’m really wanting to make this. Baking powder is pretty important. It is what makes bread rise and get fluffy. If you have self rising flower, you won’t need it. I’m not seeing a reference to high or low pressure. Is there a preferred setting? I’d like to make this, but can’t eat gluten. Would you happen to know the conversion of regular flour to gluten free all purpose flour? Thank you. It’s a 1:1 ratio to substitute GF flour, such as Bob’s Red Mill All Purpose Baking Flour. Also add a small amount of one of these: Arrowroot, Gelatin, or Agar Agar. You’ll have to look up the amount for quick breads. Can I use whole wheat pastry flour instead of white flour? Also, can I add some chopped walnuts? Not in the pressure cooker. The pressure cooker cooks with steam from the water, so you need the other pot to hold the water. Also, ALWAYS use that inner liner pot when cooking with your pressure cooker. You could bake it in the oven, but I’m not sure if that is what you are asking. I have the 6 qt instant pot & the bundt pan did not fit in it like you explained- do you have a larger instant pot? Is yours a 6 cup size? You need a 6 cup Bundt or Cake Pan (7″ is ideal), per the instructions. I have a link to the one I use below the recipe card. I made this using sour cream and it was absolutely delicious. My search for the best Instant Pot banana bread has ended. That’s great, Helen! Thank you! Hi! what kind of flour is used…plain, white, all purpose? TIA! How would you bake this in a conventional oven (temp. and time)? 350° for 35 to 50 minutes. I followed the recipe to a tee. Tastes great. The bread came out very dense. Is that the way it is supposed to be? I wouldn’t say VERY dense, but denser than in the oven. Be sure your baking powder is fresh, and that you cover the pan. I have some in my pot right now! I have 4 inch bundt pans how do you figure out how long and temp to cook them in the instapot? Maybe half the time as the pans are roughly half the size? I followed the recipe to a t with the bunt pan 7″ but the middle of the bread was uncooked should I leave it in longer? Not sure why it went well for a couple but my last two were undercooked! Hi Jeff. So the first two you made were fine, and this last one wasn’t? I don’t know what would cause that unless your pot was set to Low pressure, or was leaking steam while cooking. Maybe not enough natural release time? A fluke?! I used a silicone bundt pan for the banana bread. It was a little wide for IP but I squeezed it in. Next time I will use swerve sugars, cut down on calories. I didn’t have buttermilk so I googled and added lemon juice to almond milk, thickened up right away. That’s great, Kathy! Thank you for the tip. I’m so glad you liked it! Us there a substitute For sour cream? My banana bread came out Amazing! My Hysband loved it! Thanks again for the recipe looking forward to further recipes! Oh that’s great, Rhonda! I’m so glad! Hi Sandy! I made this recipe with the 7” bundt cake pan and it turned out great! The sides were a light brown, but the bottom (which ends up being the top) was not. It looked less cooked even though it wasn’t. I cooked it for 47 minutes then let the pot sit untouched for 15 minutes (as the recipe said), then released the remaining steam. I removed the pan from the instapot and let it sit for another 15 minutes before removing it from the pan. Should I have cooked it a little longer? My pot is a 6 qt. and I used the 1-1/2 cups of water in the pot. I followed everything in the recipe. I did use the sour cream version. I’m curious how you got the top of your cake brown like in the picture? Thank you. Can I add chocolate chips? Excited to try this! I sedan a 6 inch cake pan from crock pot. Put aluminum foil on top. Cooking for 65 minutes. (I added the Additional 5 minutes since smaller pan or should I drop it to 55 minutes? Try it like that and if it needs more time you can set it for more. I have a 10qt. Pot would I still use the 7 inch and the same recipe? Yes. If you want to use an 8″ pan, the bread will be a bit thinner, and the cook time will be about 5 minutes less.